The year 1965 was quite a time to be alive if you you were a music fan! The Beatles battled The Supremes, The Four Tops, and the Rolling Stones for supremacy at the top of the charts, and teenagers across the USA were starting garage bands left and right. Music was in the air, and the American rock and roll revolution had kicked into full swing after being jumpstarted by the British Invasion. It was also a banner year for the Fender Jazzmaster! Though Fender's first offset-bodied guitar never really took off with its intended audience--East Coast jazz snobs were still a little leery of solid-body guitars with sleek, futuristic designs--it found a whole new audience on the West Coast after The Ventures' rhythm guitarist, Don Wilson, adopted it as his main guitar in the early sixties (HERE is cool clip of Don playing his Jazzmaster on the Saturday Night Beech-Nut Show). By the mid-sixties, the surf craze had reached its peak, and the Jazzmaster had reached its first zenith of popularity. Surf music may seem like a period-specific novelty now, but back in the day surf music rivaled Motown and rock music in popularity, due in no small part to the captivating sound of the Jazzmaster. 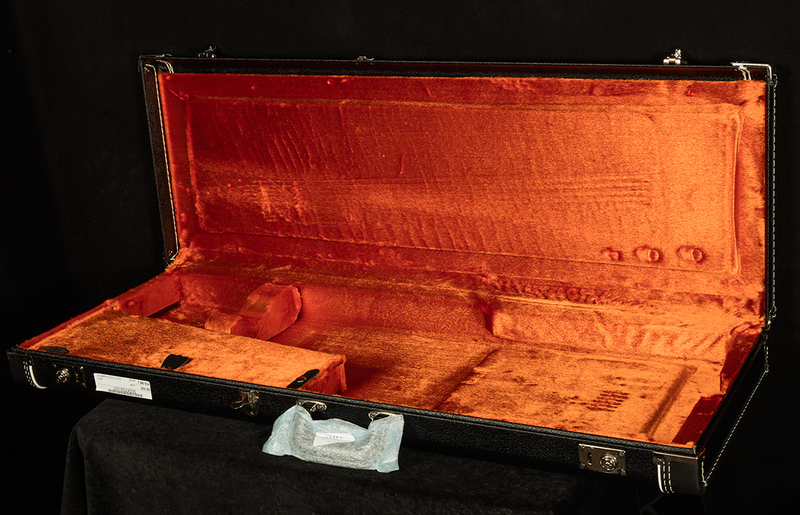 It was available in standard sunburst with a natural headstock or a whole host of flashy custom colors with matching headstocks--for a five percent upcharge, of course--and it featured a bound rosewood fretboard with pearloid dot inlays (fun fact: the Jazzmaster was the first Fender to ever sport a rosewood board!). This, along with the iconic original models from '59, is widely considered one of the definitive iterations of the Jazzmaster. Of course, all waves must crest eventually, and when surf music's popularity waned, so did the Jazzmaster's; so much so that by the time the mid-seventies rolled around it was easy to score one for less than a hundred bucks in a second-hand shop (ah, to have a time machine and a handful of c-notes...). Because these bargain-bin prices made the Jazzmaster so accessible to starving artist types, it quickly became a favorite of trendy new wave and punk guitarists like Tom Verlaine and Richard Hell of the band Television and a young bespectacled English songwriter named Elvis Costello. Costello gave the Jazzmaster its first big moment in the limelight since the surf rock craze by posing on the cover of his landmark 1976 debut album "My Aim is True" with his beloved main axe, a Jazzmaster of indeterminate vintage that had been refinished with furniture varnish! Suddenly, the sound of the Jazzmaster was inescapable. On your local college radio station, you could hear Lee Ranaldo and Thurston Moore of Sonic Youth use them to create pure aural madness on tracks like "Expressway to Yr Skull." Or, you might catch a Dinosaur Jr video on MTV and see J Mascis prove that being an indie rocker doesn't preclude one from being enshrined in the pantheon of shred gods. If you lived across the pond, you could also hear dream-pop auteur Kevin Shields create beautiful walls of undulating noise on My Bloody Valentine's landmark shoegaze album Loveless, a record that showcased his signature "glide guitar" technique--which he accomplished with the Jazzmaster's vibrato unit (Wildwoodians, if you haven't checked this record out, do yourself a favor and listen--it's a psychedelic tour de force that utilizes all sorts of interesting guitar techniques that come from way outside the "rock" tradition). The list could go on and on, but for brevity's sake, we'll just leave it at this: the Jazzmaster had finally found a home, thirty years after its release. Our American Vintage Thin Skin '65 Jazzmasters pay tribute to the sixties pawn shop specials that our indie heroes used to rewrite the book on rock music, and we believe that they embody their myriad aesthetic and sonic delights with exceptional accuracy. With their matching headstocks, cooler-than-the-other-side-of-the-pillow paint jobs, and bound fingerboards, they evoke the iconic look of 1965. Furthermore, they capture the classic signature tone of the Jazzmaster in an especially inspiring way. Speaking of which, let's address the elephant in the room: what exactly makes a Jazzmaster sound like a Jazzmaster? More importantly, why do our Thin Skin '65s provide such a sterling example of Jazzmaster tone? Well, it has to do with the inimitable alchemy between the floating vibrato and the oft-imitated, never-duplicated sound of the Jazzmaster's soapbar pickups. 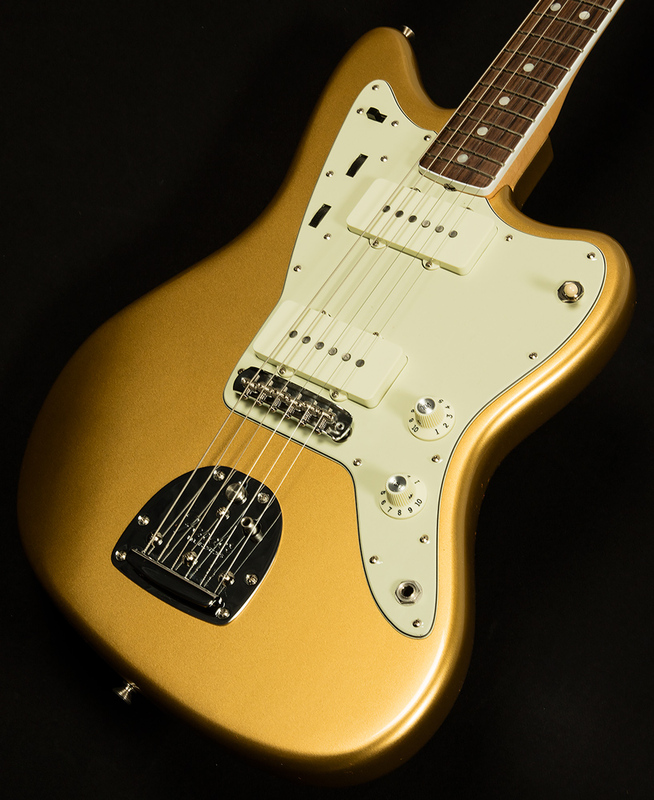 Though they are often mistaken for P-90s or humbuckers, Jazzmaster pickups are a completely unique design. They have flat, wide poles with lots of surface area, which gives them fatter bass response and more robust midrange while maintaining the clarity that Fender single-coils are known for--which makes sense, given that they were originally designed to be used for jazz! We've equipped these Thin Skins with American Vintage bridges and American Vintage pickups to ensure that they have this same combination of articulation and full harmonic response. This allows them to excel at everything from jangly dream pop to blissful fuzzed-out rock to reverb-laden surf to warm jazz (take that, East Coast jazz snobs!). Like the best vintage examples, they sing with a completely singular voice, yet they almost never sound out of place--a testament to the strength of the Jazzmaster's personality. How ironic it is that a guitar that was often cast as the black sheep of the Fender family finally managed to become a staple in American music precisely because it is so unique! Our friends at Fender have imbued these guitars with the same iconic sounds as the Jazzmasters of yore, and we know they will inspire you to create and innovate in ways you never thought possible. We invite you to take a walk on the wild side with the Wildwood-exclusive Thin Skin '65 Jazzmaster--we know you'll see why they have achieved their legendary status within a couple strums.